I bet anyone who works their way through a recipe book in a year will say that they can’t believe that a year has passed already. I think my first couple of recipes came after a jaunt through Marchmont, Edinburgh in a hunt for some fruit and vegetable shops, which kick-started my enjoyment in buying my ingredients a little more locally. It didn’t always happen and I found myself in many a large supermarket last year, but I also found my way to butchers, fishmongers, and fresh food markets, where I hadn’t spent much time before my recipe challenge. I loved going to the butchers to buy cuts of meat that I’d never cooked with before, like oxtail and liver, and googling what a Jerusalem artichoke looked like as I stood over boxes of strange looking vegetables at the market. My year of cooking encouraged me to try new foods and cooking techniques, and branch out a little in my shopping. There were times that I couldn’t find an ingredient when I needed it, or just couldn’t be bothered to source it at that time, so I substituted for other things, but I think that’s the beauty of cooking for yourself. I have more confidence in swapping ingredients for other things and adding bits and pieces into simple recipes to really make them shine. On days when I wasn’t doing recipes from the book I had thoughts like “should I just make a quick caper mayonnaise to go with this fish?”, something that I would have thought just a waste of time before. One thing that did trip me up on occasion while working through the book was sticking to the seasons, as I missed the opportunity to buy some of the ingredients when they were at their best. Eating seasonally is something that I’ve been working on for a while, but clearly haven’t quite got to grips with it yet. It’s too easy to decide what you’re going to cook before walking into a supermarket, and therefore pick up ingredients that aren’t in season in the UK but have made it to the shelves from Kenya or somewhere like that. I get a little more excited about cooking when I’ve picked up something grown in Kent or Kirkcaldy, so I need to remember this when planning what to cook and heading out to the shops. The recipes in River Cottage Everyday ran beautifully through the seasons, with substitutions for ingredients that were best at certain times of the year. I don’t think I could have picked a better book to start all this off with. When I’m cooking for myself while working in Newcastle for the week, I tend to be pretty vegetarian, or pescatarian, really only eating meat when I’m back with the boy in Edinburgh at weekends. We both love to do a roast or a hearty stew in the winter, so I saved a lot of the recipes for the weekends. Not eating meat mid-week made me want to buy higher quality meat at the weekends, as I knew that I could spend a bit more money on it. In the last few years I have struggled with my desire to not buy low-quality, pre-packed supermarket meat, but often not being able to afford/justify the costs of the higher quality stuff. Working through River Cottage Everyday has opened my eyes to more sustainable fish and cheaper cuts of meat that I can buy at the butcher and that won’t break the bank. Although I probably won’t work through another recipe book for a while (I am a bit tempted by Nigella’s ‘At my table’, though), I really hope that I can continue cooking the way I have been for the past year. I feel like I’ve got back into the swing of something that I have always loved doing, but had lost my way with a bit when I moved to Newcastle and was spending a lot of time on trains. I love cooking for people and I think the boy has had a good year of it! The only downside was that I felt like I always had loads of washing up to do. Maybe a dishwasher would come in handy if I decide to take on Nigella. I would wholeheartedly recommend working your way through a cookbook, especially if you feel like you have become a little lazy with your cooking. Or even if you haven’t, it’s always nice to get back in tune with the seasons and broaden your recipe repertoire a little. There are recipes from the book that I would do time and time again and will be firm go-tos from now on. It is even safe to say that devilled liver will now feature in my cooking. Choose your book wisely if you want to just get to grips with the basics again, one with no restrictions and no fancy ingredients that will leave you with dozens of half-finished packets that you’ll never use again. 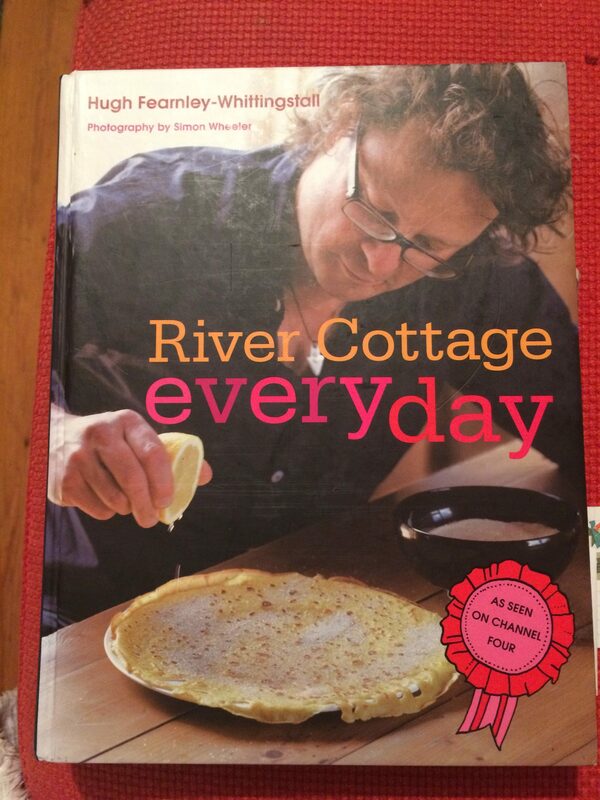 River Cottage Everyday was perfect for this, so maybe plump for this book if you fancy a recipe challenge. Go roast some artichokes and slow-cook some beef shin, you never know what will stick and you’ll be cooking for years to come. Just remember, apples explode in the oven if you don’t score them round the middle. Posted in Blog, Recipes and tagged blog, challenge, cookbook, cooking, recipes, River Cottage, seasonal.